ART – a German tuning company is quite unknown to majority of us. If somebody says „tuning and Mercedes“, all will think about good old AMG company. But ART is very competitive company also compared to AMG – as we can see on its new bullet. Mercedes-Benz CLS is very beautiful car also in stock production. This limousine attacked the market during its premiere on the Geneve carshow. A distinctive shape similar to a missile or bullet improves the aerodynamics to the new level. We can find four engines in the “menu”. A 6-cylinders diesel 320CDI engine with output power of 224hp, 350CDI with 272hp. 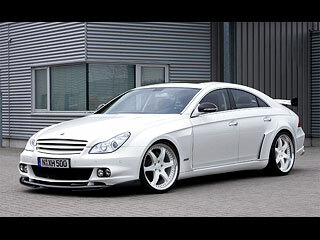 CLS 500 has 306hp and finally, modified AMG engine with powerful 476hp. ART brings not only a performance modified car but mostly with the design improvement (styling). There are 2 performance versions, with AMG55 engine as the base. First has 560hp and second 620hp with unbelievable torque – magnificent 890Nm. 0-100kmph acceleration is 4,4 seconds, or 4 seconds in case of more powerful version. Of course, it was necessary to adjust other component parts to achieve those parameters. The car disposes of the electronic adjustable chassis, which regulates height of car also automatically. ART also expanded the tread width – 70mm in the front and 80mm in the rear. CLS has also tougher screw stabilizers. A connection with road is mediated by three-piece alloy wheels - in the front with a dimension 9,5x20 and 10,5x20 in the rear. 20” discs – quite good choice also for chrome ones, but ART have chosen expressive white color. Tyres have dimensions 225/30 and 305/25. A stock exhaust tract was replaced by the new whole stainless. Catalyzers were also replaced with more sporting ones and the opening of exhaust system is tipped with a duplex system with two tips on both sides. Each tip has 100mm in diameter and has a double wall. The exterior – a die-hard stock design is after the modification something unbelievable. When CLS came to the market – it was presented as coupe-limousine, which was something unreal at that time. The ART bodykit emphasizes its sharp part of this hard sportsman. All complements are visible on the first sight, but they don’t destroy original lines. New fog-lamps in the 2x2 arrangement are complements of a new front bumper. New carbon spoiler in two versions brings the look of an extreme predator. A delicacy of this car are the rear mirrors from carbon fibers. Front bumpers have also new air shafts nearby the doors. Stretching from bottom to the upper part of a bumper and indicating high performance category. Also rear bumper was replaced by new one with plastic or carbon diffuser. Air dams used for cool-down brakes was installed to the mudguards in similar style like front ones. Rear doors was also modified for efficiency – massive spoiler in the color of bodywork was installed on the trunk part. An interior have real sporting spirit. Complements are made from carbon and alcantra. Mercedes-Benz logo was replaced with ART, but it’s no problem to arrange with producer for any individual requirements. ART designers are ready for unaccustomed demands from their customers. 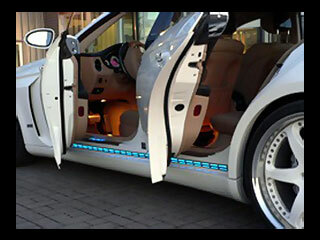 What's your opinion about this Mercedes Benz ART tuning?